Daniel Goleman (born March 7, 1946) is an author and science journalist. For twelve years, he wrote for The New York Times, reporting on the brain and behavioral sciences. His 1995 book Emotional Intelligence was on The New York Times Best Seller list for a year-and-a-half, a best-seller in many countries, and is in print worldwide in 40 languages. Apart from his books on emotional intelligence, Goleman has written books on topics including self-deception, creativity, transparency, meditation, social and emotional learning, ecoliteracy and the ecological crisis, and the Dalai Lama’s vision for the future. Daniel Goleman grew up in a Jewish household in Stockton, California, the son of Fay Goleman (née Weinberg; 1910–2010), professor of sociology at the University of the Pacific, and Irving Goleman (1898–1961), humanities professor at the Stockton College (now San Joaquin Delta College). His mother's brother was nuclear physicist Alvin M. Weinberg. Goleman studied in India using a pre-doctoral fellowship from Harvard and a post-doctoral grant from the Social Science Research Council. While in India, he spent time with spiritual teacher Neem Karoli Baba, who was also the guru to Ram Dass, Krishna Das and Larry Brilliant. He wrote his first book based on travel in India and Sri Lanka. Goleman then returned as a visiting lecturer to Harvard, where during the 1970s his course on the psychology of consciousness was popular. David McClelland, his mentor at Harvard, recommended him for a job at Psychology Today, from which he was recruited by The New York Times in 1984. Goleman co-founded the Collaborative for Academic, Social, and Emotional Learning at Yale University's Child Studies Center, which then moved to the University of Illinois at Chicago. Currently he co-directs the Consortium for Research on Emotional Intelligence in Organizations at Rutgers University. He sits on the board of the Mind & Life Institute. Goleman authored the internationally best-selling book Emotional Intelligence (1995, Bantam Books), which spent more than one-and-a-half years on The New York Times Best Seller list. In "Working with Emotional Intelligence" (1998, Bantam Books), Goleman developed the argument that non-cognitive skills can matter as much as IQ for workplace success, and made a similar argument for leadership effectiveness in Primal Leadership (2001, Harvard Business School Press). Goleman's most recent best-seller is Focus: The Hidden Driver of Excellence (Harper, 2013). In his first book, The Varieties of Meditative Experience (1977) (republished in 1988 as The Meditative Mind), Goleman describes almost a dozen different meditation systems. He wrote that "the need for the meditator to retrain his attention, whether through concentration or mindfulness, is the single invariant ingredient in the recipe for altering consciousness of every meditation system". ^ "Goleman was Pacific professor, women's advocate". The Record. Retrieved September 13, 2015. ^ "Krishna Das : Songwriter Interviews". www.songfacts.com. Retrieved April 19, 2018. ^ a b "Bio". Daniel Goleman. Retrieved July 12, 2012. ^ Daniel Goleman, The Varieties of Meditative Experience. New York: Tarcher. ISBN 978-0-87477-833-5. p. 107. 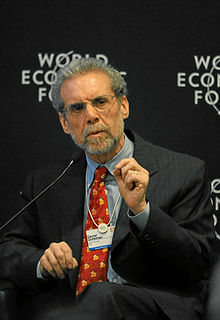 Wikimedia Commons has media related to Daniel Goleman.